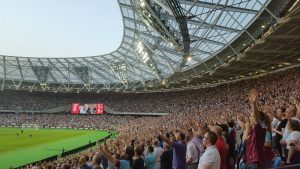 Official attendance at West Ham games at the London Stadium passed the one million mark last Sunday. Excluding cup games against Bolton Wanderers (39,806) and Shrewsbury Town (39,867) all Premier League games have been officially virtually sold out meaning almost every ticket for every seat was sold. In the seventeen league games, official attendance ranged from a low of 56,197 against Watford to a season high of 56,988 against Spurs. Average attendance for Premier League matches this season at the former Olympic Stadium is 56,881 from a theoretical maximum capacity of 57,000. The total official attendance for all nineteen home games including cup games this season is 1,042,658. Real attendance is likely to considerable lower with many thousands missing from the West Ham v Man City game on Sunday afternoon. The real attendance measured by recording those passed through the turnstiles is said to range from 47,000 to 53,000 per game meaning 4,000 to 10,000 season ticket holders leave their seats empty each game. This is made more noticeable because of the white seats of the London Stadium although the Premier League report around an average 10% non-attendance of season ticket holders. Assuming an average of 7,000 missing per league game that means as many of 119,000 season holder ticket seats weren’t used this season which could make the real attendance more like 923,658 so far but with two home games remaining the real attendance should also pass the one million mark by the time the season ends.